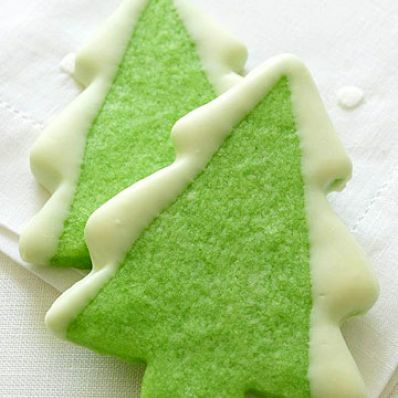 Dip these festive cutout cookies in white chocolate to make a winter wonderland of trees. 1 of 3 Blend flour and salt in a small bowl. In a large bowl, beat butter and sugar. Beat in yolks, vanilla and food coloring. Stir in flour mixture until dough comes together. Divide in half; flatten into disks. Wrap in plastic and refrigerate 2 hours. 2 of 3 Heat oven to 325 degrees F. Roll dough 1/4 inch thick on floured surface. Cut out trees; reroll scraps. Transfer to ungreased baking sheets. 3 of 3 Bake at 325 degrees F for 10 minutes. Remove cookies from oven and brush with egg white. Return to oven; bake 4 to 5 minutes more, until shiny but not brown. Transfer cookies to rack to cool. Dip edges in white chocolate. Let dry on parchment or waxed paper. Per Serving: 4 g sat. fat, 128 kcal cal., 7 g Fat, total, 15 g carb.